The risk factors of developing gastric carcinoma are male, blood group A, age more than 50 years old, dietary rich with nitrosamine, dietary rich and excessive with sodium intake and sufferer of chronic gastritis. 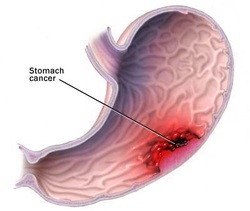 Gastric carcinoma may present with symptoms and signs such as loss of weight, anorexia, gnawing epigastric pain and vomiting which are unresponsive to antacid. Patient may also present with thickening and hyper pigmentation of the epidermal of the flexural areas. This is known as acanthosis nigricans. There are two different types of gastric carcinoma in term of pathological studies. There are diffuse type and intestinal type. Diffuse type is aggressive form of gastric carcinoma which metastasis locally to the liver or lymph nodes. Diffuse type commonly present as signet ring cells within the gastric wall. Signet ring cell is a cluster of gastric type mucosal cell. Linitus plastica is a term describing the infiltrative condition which leaf to rigid wall of the stomach which also known as leather bottle stomach. Intestinal type of gastric carcinoma mostly present as lesion in the pre pyloric region or the antrum. The lesion mostly present as irregular necrotic base with heaped up margins. Besides that intestinal type of gastric mucosa may also present with glandular formation of the mucin producing cell. Gastric carcinoma may also associate with Krukenberg tumor which is bilateral metastases of gastric tumor to ovaries ( present with signet ring cell and mucosal layer). Gastric carcinoma may present with hypochromic microcytic anemia. 1.Ming, Si-Chun. “Cellular and Molecular Pathology of Gastric Carcinoma and Precursor Lesions: A Critical Review.” Gastric Cancer 1, no. 1 (December 1, 1998): 31–50. doi:10.1007/s101200050053. 2.LAUREN, P. “The Two Histological Main Types of Gastric Carcinoma, an Attempt at a Histoclinical Classification.” Acta Pathol. Microbiol. Scand. 64 (1965): 31–49.